What makes Atlantic Awards the best program in the industry? Just like everything else, it was designed with you in mind. It's easy to join. Easy to earn — the fastest ways to earn Atlantic Awards is to always choose Atlantic FBOs and qualify for Double Awards. Once you have redeemed 50 awards ($200) in a calendar year, you are eligible to register for an American Express Serve® Prepaid Debit Account. With a Serve® Account you can make purchases virtually anywhere American Express® is accepted. Thank you for your loyalty to Atlantic Aviation. We appreciate your business. Awards Support can be reached at 888-213-8060 as well from the Contact Us area. Signing up couldn't be easier. Just give us your info, and you're ready to start earning Atlantic Awards. Then, for every 100 gallons of Jet A fuel you purchase per transaction, you'll receive a $4 award. Visit the Atlantic Awards page and login to your account. Then you can redeem your earned Atlantic Awards or transfer them to another member within your flight department. All registrants must be at least eighteen (18) years of age or nineteen (19) years of age if you reside in a state where the age majority is nineteen (19). A valid U.S. issued Social Security Number, Date of Birth, and U.S. physical street address must be provided and are subject to American Express' verification process. Some flight departments are not eligible for Atlantic Awards at specific locations or nationwide. Visit any Atlantic Aviation FBO and you will earn a $4 Atlantic Award for every 100 gallons of Jet A fuel you purchase per transaction. Then simply login to your existing Atlantic Awards Account from our website and redeem your earned awards or transfer them to another employee within your flight department. Once you’ve redeemed the required calendar year threshold of 50 awards ($200), you will be prompted to confirm your account information and you may register for an American Express Serve® Prepaid Debit Account. 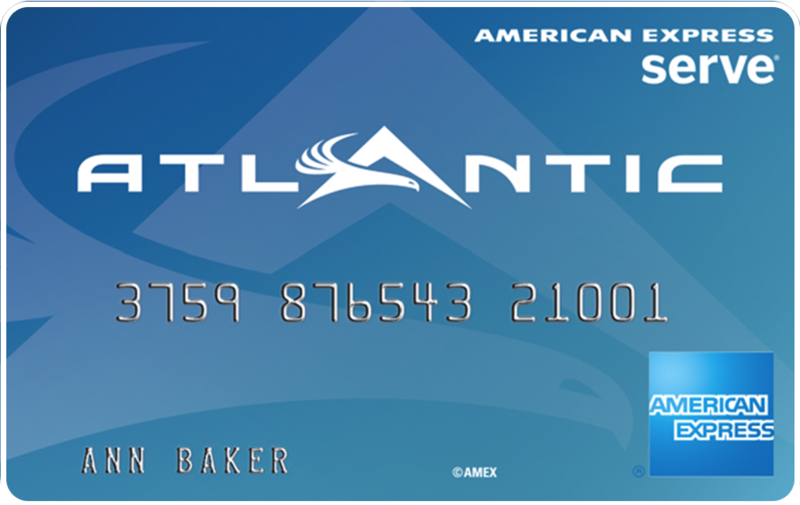 After successful registration, you will receive an American Express Serve® Card in the mail loaded with the value of the Atlantic Awards redeemed. After the initial load of 50 awards ($200), you may add the value of subsequent Atlantic Awards to your Serve® Card throughout the year. Don’t forget to take advantage of Double Atlantic Awards to earn faster – you’ll earn 2 Atlantic Awards per 100 gallons of Jet A fuel you purchase per transaction with required minimum uplift, determined by aircraft type. Try our calculator to see how easy it is to qualify. Atlantic Awards are issued for Jet A fuel purchases only and must be redeemed by January 5th of the following year in which they were earned. If you do not meet the threshold of 50 awards ($200) in a calendar year, they will NOT carry over to the next year. Atlantic Awards can only be redeemed once, and may not be bartered, sold or gifted. Lost awards will not be replaced. Once you have received and activated your American Express Serve® Card, you can use it to make purchases virtually anywhere American Express® Cards are accepted. Any additional Atlantic Awards you redeem during the calendar year may be loaded to your Serve® Account. Go to Manage My Atlantic Awards to view your awards status at any time. Please note: The amount displayed is not your card balance. Check your American Express Serve® Account balance at Serve.com. Double Awards will help you, our most loyal customers, get whatever you want even faster! Select an aircraft make and model below to see how easy it is to qualify! How are Atlantic Awards earned? For every 100 gallons of Jet A fuel you purchase per transaction, an award worth $4 can be assigned to a member of your flight department at the time of invoicing. Can an award be entered — or redeemed — more than once? No. Since awards are tied to a specific fuel purchase, they can only be redeemed once. Lost awards will not be replaced. Can my awards be transferred? Awards can only be redeemed once and may not be bartered, sold or gifted. They may only be transferred to or redeemed by a member of the flight department on the trip they were issued and requires acceptance. Accounts are reviewed monthly to ensure compliance. How long does it take for redeemed Atlantic Awards to be loaded to my American Express Serve® Account? Generally, after successful registration, Atlantic Awards that are redeemed will be loaded to your Serve® Account within 2 business days. Please note that no awards may be loaded to a Serve® Account until you meet the minimum of 50 awards ($200) in each calendar year. Yes, Atlantic Awards must be redeemed by January 5th of the following year in which they were earned. Do transferred Atlantic Awards also expire? Yes, Atlantic Awards that are transferred also must be redeemed by January 5th of the following year in which they were earned, regardless of when they were transferred. Why don't my Atlantic Awards earned and Atlantic Awards loaded match? The amount loaded displays the total YTD that has been loaded to your American Express Serve® Account. This can be different from the amount of Atlantic Awards earned within the same year. Check your Atlantic Awards History to search by program year. What is an American Express Serve® Card? Your American Express Serve® Card will arrive loaded with any redeemed Atlantic Awards and can be reloaded using additional Atlantic Awards and other funding sources, so don’t throw it away! You can learn about the additional features of your American Express Serve® Account by visiting serve.com/getpaid. How long will it take me to get my Serve® Card? Once the threshold of 50 Atlantic Awards ($200) is met, please allow 2 weeks for the delivery of your Card after successful registration. What if my Serve® Card doesn't arrive after two weeks? If you haven't received your Card after two weeks, we invite you to contact us here for assistance. Where will my Card be mailed? Cards will be mailed to the address provided during the profile update process after redeeming 50 awards ($200) in your first calendar year. Please note the Card can only be mailed to a U.S. street address (cannot be mailed to P.O Boxes). What happens to the money on my Serve® Card at the end of the year? Your American Express Serve® Card is valid 5 years from the date issued. Once Atlantic Awards have been redeemed for funds loaded onto your Serve® Card, your funds will carry over from year to year until your card’s expiration date. If I have problems or questions about my card — including the card balance — who do I call? You can check your balance on your American Express Serve® Card by logging into your account at Serve.com. You may also call a Serve® representative at 800-954-0559. Are there any monthly fees with an American Express Serve® Card? $0 for the current and next two monthly statement periods after you receive a disbursement or $0 during each monthly statement period in which you receive a direct deposit or add $500 or more to your Account. Otherwise, you will be charged $1.00 monthly fee (no fee in NY, TX, and VT). Individuals only. All registrants must be at least eighteen (18) years of age or nineteen (19) years of age if you reside in a state where the age majority is nineteen (19). A valid U.S. issued Social Security Number, Date of Birth, and U.S. physical street address must be provided and are subject to American Express' verification process. Atlantic employees and their families are not eligible for Atlantic Awards. Some flight departments are not eligible for awards at specific locations or nationwide. If I have problems with my Atlantic Awards account through the Atlantic website, who can I call? Awards Support can be reached at 888-213-8060 as well as from our Contact Us area. Click Log in at the top left side of site. On the log in page, choose "Forgot your Username?" or "Forgot your Password?" at the bottom and answer the required security questions to retrieve your username or password. Log into your account and click on edit my profile. You will be able to change your password from this page. Why do I have to provide my SSN? What will you do with it? This information is required by American Express as part of their verification process. Do I need to pay taxes on my Atlantic Awards? You will be assessed taxes for annual income of $600 or more. The Amount Loaded on your Manage My Awards page will match the amount on your 1099 form. A 1099 will only be issued if you meet the $600 income level. How can I find the total amount I've received since joining Atlantic Awards? For a complete history of your Atlantic Awards, contact Awards Support.